For the first time flooring shopper, deciding if you want to go with solid hardwood flooring or engineered hardwood flooring for your home can be very confusing. In this article I will address as many concerns and questions as I can when comparing these two amazing choices in home floor coverings. If you are struggling to decide then you have come to the right place. I will do my best as to remain as unbiased as possible so that you can make the best decision for your home and lifestyle. Solid wood flooring will come in a bunch of different types of wood, including both domestic (mainly North American species) and Exotic species. Because of the construction, it is a bit more expensive that engineered hardwood flooring. For some this is as factor that they get hung up on, but if you have a knack for solid wood, I would not let this sway you from your decision. A few bucks a sq. foot more, could affect your budget now, but in the long run, you may not be satisfied with your flooring if you are making your decision based on finances rather that your person preferences. 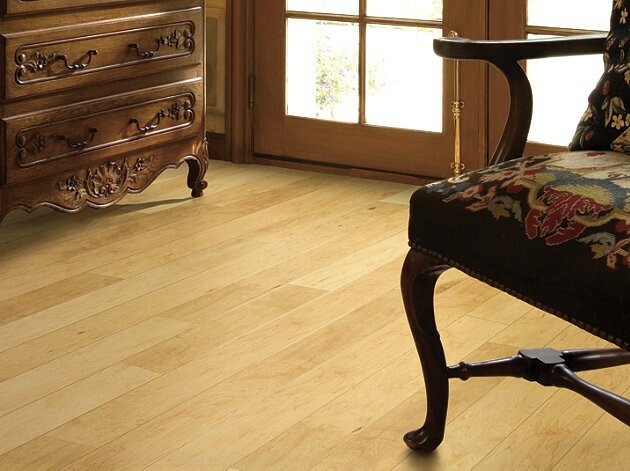 Solid hardwood flooring is not recommended for installation in high moisture areas of the home. This means the kitchen, bathrooms, and basement. You see, high moisture can cause solid hardwood to ripple or even buckle over time. This is especially prevalent during seasonal changes. However in my many visits to home with Solid hardwood installed throughout the home, I have found that if you keep the moisture levels down, it is completely possible to preserve and protect your solid floors for a certain amount of upkeep. So the point is, that if you put in the effort you can successfully have hardwood flooring throughout the home, if will just take extra care. Probably the best advantage of choosing a solid hardwood flooring, is that fact that you will be able to refinish the surfaces many times throughout its lifespan, as far as warranties go, I have seen many solids with 50 year warranties, and have also been in homes that are well over 100 years old that still have the original flooring, and they looked gorgeous. I have found engineered hardwood flooring to be an incredible floor covering through my research. It typically comes in the same species available in solids, minus a few options. However in my experience I have found engineered woods are less expensive to buy, maintain, and install. This is an excellent option for someone who is purchasing their first flooring because of the ease of use. Many people are still a little unsure of how it is constructed and more often than not accuse it of being a laminate flooring. This could not be further from the case though, because engineered hardwood floors contain no laminates. In fact it is constructed of 100% real wood. It is actually made by gluing several plies of wood together with a decorative top layer of wood that has been finished to look just like solid hardwood. As I’m sure you have guessed, this layer construction actually strengthens the structure of the flooring, and actually makes engineered hardwood flooring slightly more durable than solid hardwood. Unfortunately though you may only be able to refinish the surface of once or twice because after the top layer is gone, you are left with just the plied layers underneath. This being said though if taken carpet of, your engineered option has the ability to have a life span just as long as that of the solid wood option. So do not let that deter you from this amazing option. The final thing that I will touch on about engineered wood floors is that they are much more moisture resistant that that of solids. This allows you to install anywhere in the home without worrying about moderate moisture in the air. And because of the construction of the engineered hardwood flooring you will not have to worry about buckling as much. I hope that this comparison of Solid and Engineered hardwood floors have shined a light on which type of flooring will better serve your home and lifestyle. And I can’t wait to see your comments and opinions. Until next time, Happy Flooring!